Have you ever had a conversation you felt you needed to have and really didn’t want to? Maybe this happens with various people – or the same person – every week or so. Or every month? The patterns can transform the energy into something more interesting. Is it every day? Never? (That might be a pattern too.) At home? At work? 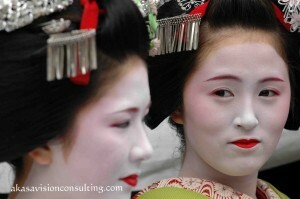 In the floating world of Kyoto, one of the geisha’s arts is that of conversation. I didn’t hold much store by that, until I was talking to a geisha one night at a teahouse party. I suddenly realized that without me noticing I’d become putty in her hands. Then I understood what they meant by “art” of conversation: it was a kind of skilled entertainment, comfort or seduction, just like the geisha’s other arts of music, dance, service and hospitality can be. She had used charm and friendliness to help me feel … charmed and befriended. I’m a good communicator. Why would I need to do it differently? Fair enough. In the early 1990s took some intensive Japanese language courses in Kyoto with a few other Americans, a Taiwanese woman, three mainland Chinese, a Korean man, a Sri Lankan and a Filipina. Our approaches to language and communication were radically different. “Tanaka-san and Suzuki-san discussed their business plans during break time,” one of my Asian cohort would recite in flawless Japanese. “When I arriving to Japan, I understand that human feelings same even when country different,” I would blurt out. Just like anything else, different styles of communication are suited for different things. How well do you know your own communication style? And what it’s good for? When it’s not so useful? After years of suffering from ennui in my youth, I compensated by becoming very solutions-oriented. If you’re experiencing a challenge, I’d be happy to be of service, in particular by discussing several potential avenues to how you might resolve it. Conversely, I’m probably not the best choice if someone just wants to get something off their chest. That kind of listening is a skill I admire in others, but not in a way that makes me also want to get really good at it myself. And that’s ok! It’s good to try to be well-rounded and balanced, and we can’t be everything for everybody all the time. Recognize what you’re good at, what you’re not, and adapt if it doesn’t match your values. If it does, know who to go to when the communication needs don’t match your skills. This kind of honest evaluation gives me a greater feeling of respect and appreciation for people who have skills that I don’t. And for my own as well. And humility for all the skills I know I don’t have. But what if this communication problem is really theirs? It could be. Thing is, there are seven billion people on the planet, and you get only one vote. You can try getting someone else to do it your way, but why would they hand over their vote to you? Because you’re their boss? It doesn’t usually work that way, at least not well. What’s the stated objective here? Do I have an unstated objective? What is it? Have I shared that with Tristan clearly? Does Tristan have an unstated objective? Have I actually asked him about it? Why would Tristan want to work on my objective? What am I willing to do to help Tristan attain his? Can I ask him in a different way than I have been asking him till now? Remember that these may or may not work. I find though that I feel better for stretching my communication muscles. And other people seem to appreciate efforts to try things in different ways. We all enjoy getting unstuck in little ways. Welcome to being human. Take it easy on yourself, ‘cause life ain’t a cakewalk. Make sure you’re getting what you need to show up in a healthy way. Get some fresh air, change your space, stretch, stay hydrated, and all that yummy stuff. I also like to try using different functions to bump myself out of habit ruts. If I’m mulling it all over in my head, I try to remember to check out the feelings. Or play around on my white board with different colors to move it from my head and into the sensing function. Diagrams can make it all seem very logical, and so on. When you’re feeling good, that’s the time to start exploring the art of conversation. What kinds of approaches to communication have worked well for you?